In 1962, the first visible light-emitting diode (LED) was created, and today, the technology has grown in popularity. According to Energy Star, LED lighting is roughly 90% more efficient than incandescent light bulbs. This technology relies on an electrical current to pass through a microchip, which illuminates the LEDs upon activation, which produces visible light. LED lighting provides many benefits that set it apart from traditional lighting solution. LED lighting technology is highly energy efficient. When compared to incandescent lighting, residential LED lights can use up to 75% less energy. LEDs also provide directional lighting, meaning they emit light in a specific direction, which minimizes wasted light and energy. This will amount to you saving on energy, leaving more in your pocket. 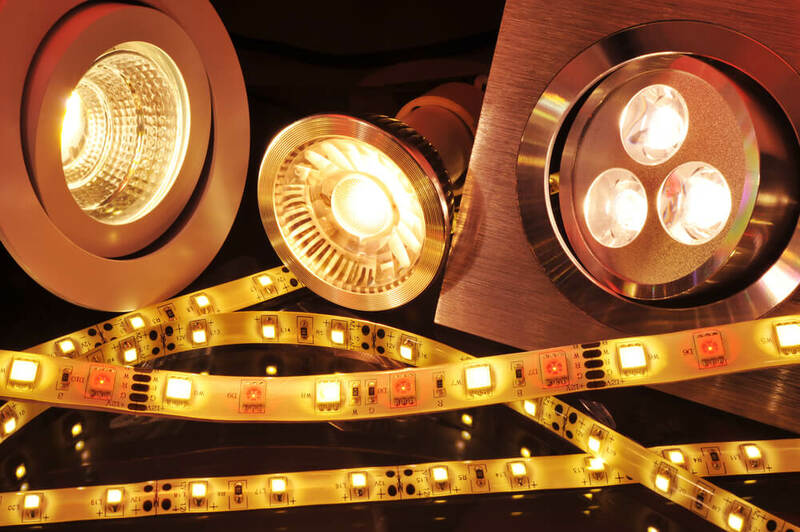 Led lights’ longevity significantly exceeds that of incandescent lighting, lasting some 25 times longer, dimming over time, rather than “burning out,” as is common with incandescent lamps. Taking into account the quality of the lamp, good quality LEDs generally have a life expectancy of 30,000–50,000 hours or longer, compared to the 1,000 hours of the operational life of a typical incandescent bulb. At low operating temperatures, LEDs increase in performance, unlike fluorescent lamps that require a higher voltage to get started. LEDs make for ideal lighting for things, such as refrigerated display cases in a supermarket and a cold storage warehouse. Based on the Department of Energy (DOE) testing of an LED refrigerated case light, it was discovered that it measured 5 percent higher efficacy in lumens-per-watt at -5°C, compared to operation at 25°C. The structural integrity of LED lights is such that the lights will not break and are immune to vibrations because they are in a solid state and the chip used is encapsulated in an epoxy resin rather than a filament or neon gas. Traditional fluorescent bulbs are far more susceptible to breakage being made from fragile elements, commonly glass. According to Energy Star, only about 10% of the electricity consumed by incandescent lamps is converted into visible light, leaving the other 90% to be released as infrared (IR) or radiated heat. This excessive heat and ultraviolet radiation (UV) presents a burn hazard, a feature that does not accompany LEDs, which are IR or UV free. LED lighting is a beneficial alternative to traditional lighting solutions such as fluorescent and incandescent lights. LEDs are energy efficient, durable, have no IR and UV emissions, works well in the cold and can last a long time. Contact Philip M. Brunelli Jr. Master Electrician to get LED lighting for your home or business!